Modernize product documentation by creating HTML5-based Help centers featuring top navigation and a responsive design that adapts to users’ screens–from desktops and notebooks to mobile phones and tablets. Streamline the process of creating and delivering HPE’s documentation through content re-use and single-source, multi-channel publishing. Efficiency: Flare’s topic-based single-source publishing facilitates content reuse and streamlines the delivery of information across 15 online Help centers and supporting PDFs. Intuitive Experience: HTML5-based Help sites created with Flare feature responsive design and top navigation to provide users a modern, intuitive web experience on their devices of choice. Easy Navigation: Tables of contents (TOCs) enable users to easily find and access the information they need, while Flare’s frameless HTML5 output allows for easy incorporation of custom Google search in Help centers. Easy Customization: Snippets, conditional tags, and native XML functionality in Flare enable HPE to customize the text and embedded multimedia of different Help centers with minimal effort. Hewlett Packard Enterprise (HPE) empowers organizations around the world to make their IT environments more efficient, productive, and secure with products that span from the cloud and data center to workplace applications. Included in this comprehensive portfolio are HPE’s Application Delivery Management (ADM) software products, which help businesses accelerate the delivery of optimized applications that deliver superior user experiences. 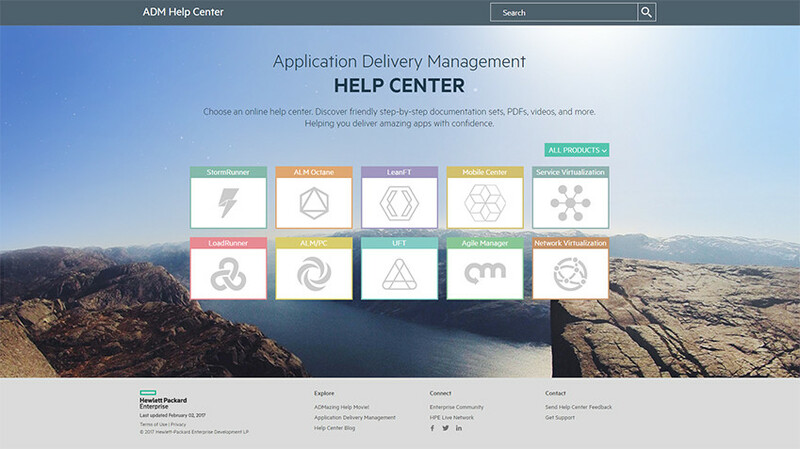 To help customers set up and deploy its ADM software effectively, HPE delivers a range of product documentation via online Help centers built with MadCap Flare. Today, HPE relies on MadCap Flare’s single-source, multi-channel publishing capabilities to deliver this information both as PDFs and as HTML5-based responsive Help that automatically adjusts to users’ screens, from desktops to mobile devices. Since 2011, HPE has relied on MadCap Flare to produce the company’s online Help and PDF documentation. However, in 2015, the HPE information engineering team sought to better support the growing number of customers who wanted cloud-based information available from both their computers and mobile devices. “While using Flare 10, we decided that we wanted to move all of our documentation into online HTML5-based Help centers so that everything for a customer’s product documentation needs would be centralized in one place,” recalled Yvonne Baynash, information engineering manager at HPE. HPE also wanted to redesign its Help to look less like traditional, standalone documentation, as well as make it easier for customers to navigate. When the company learned that MadCap Flare 11 would feature an HTML5 format with top navigation that enables the online Help to look more like a modern website, HPE saw this as an opportunity to move from the traditional tripane Help and create the modern, web-based Help centers it envisioned. “We saw the new frameless top navigation functionality available with the new release of Flare, and it aligned perfectly with what we were looking for to help reinvent our Help system as live websites,” explained Reuven Fine, information engineering manager at HPE. Today HPE provides customers approximately 15 HTML5-based Help centers, with more planned in the future, which are websites that deliver information on how to effectively use its ADM solutions. These centers are all tied into one main Help center that helps customers to navigate across the individual ones. Additionally, the Help centers provide downloadable PDF files that complement the web-based documentation. Our writers were amazed by the speed with which Flare built our online outputs. It used to take us more than half an hour to create a project. Now it just takes under 10 minutes. By taking advantage of MadCap Flare’s topic-based authoring and single-source publishing, the information engineering team continues to benefit from the streamlined content delivery and maximum content reuse first achieved with its earlier Flare-based Help system. The HPE team has gained additional efficiencies through the extensive use of topics and tables of contents (TOCs) in MadCap Flare. The information engineering team also makes extensive use of snippets, variables, and conditional tags in MadCap Flare to maximize content reuse for its different outputs. Flare makes it so easy to produce separate outputs using the same topics, helping us to support different groups of users with minimal effort and maximize productivity at the same time. Meanwhile, HPE takes advantage of conditional tags to customize content for different versions of its product guides. Significantly the use of conditional tags extends to descriptions of future product features added into a Flare project. The HPE team applies conditional tags to that content, so MadCap Flare can automatically publish the updates once the new product version goes into production. To enhance the quality of its online Help, HPE’s writers use MadCap Analyzer, which is fully integrated with MadCap Flare. It analyzes HPE’s Flare-based content to help find issues, such as missing content and redundant topics that aren’t linked from TOCs, and then makes recommendations for correcting them. 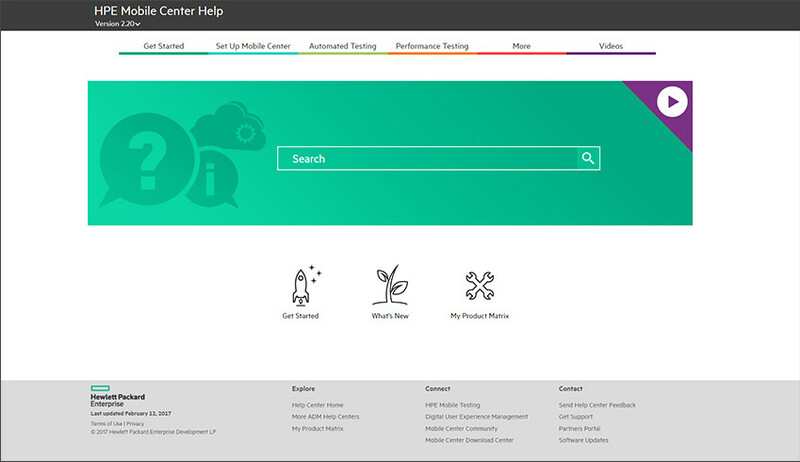 For HPE’s customers, the most dramatic difference is the modern user experience provided by the 15 new web-based Help centers, which feature a responsive design and top navigation. To assist in developing the framework for the new Help centers, the HPE team brought in MadCap partner and distributor Tech-Tav Documentation, a leading provider of technical communications services based in Israel. 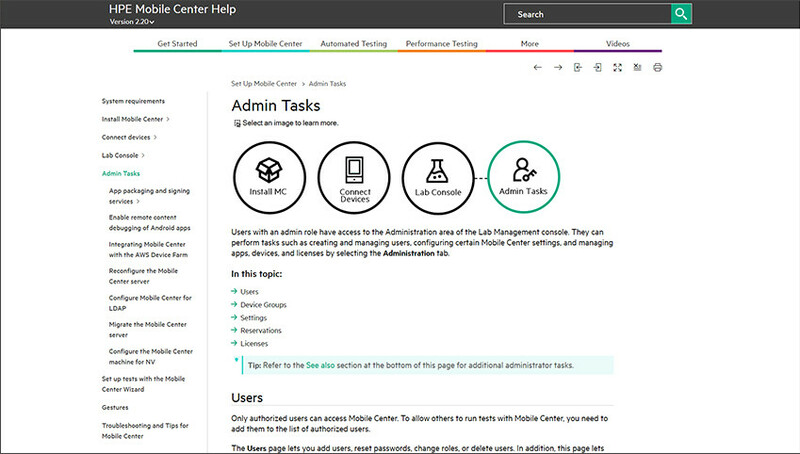 Today, the online Help centers feature cleaner, state-of-the-art web layouts, which the HPE team has created by replacing the traditional tripane format of online Help websites with the frameless top navigation output for HTML5. Additionally, the frameless feature of HTML5 enables search engines, such as Google, to easily access the content. “Flare’s responsive design feature is terrific. With a single output, we can deliver a properly proportioned view of our online Help regardless of the user’s device. Significantly, the HPE online Help centers’ responsive design means that the interface automatically adjusts to users’ screens–whether they are using a desktop system, mobile phone, or tablet. The HPE team also takes advantage of MadCap Flare’s native XML foundation to easily add in multimedia that they have created using external XML tools. These include images, movie galleries, and animated GIFs. The ability to go under the hood and access Flare’s XML code has been very advantageous. It has allowed us to fine-tune formatting and effectively troubleshoot problems.